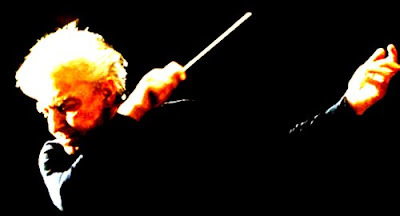 I have seen conductors, more often than composers, close to megalomania. I once interviewed Karajan and he had the whole of the Berlin Phil on the stage at the Festival Hall waiting for a rehearsal. Our slot ended, but Karajan wanted to keep talking. After a while there was a rather tentative knock on the door and the leader of the orchestra poked his head round and said, 'Maestro, the orchestra are waiting on the stage.' Karajan literally shouted 'Raus! Raus!' and shooed this rather distinguished musician away. Michael Berkeley in a Guardian interview about his new opera For You which has a libretto by novelist Ian McEwan. Raus is German for 'get out!' Another Karajan story here.